How Far is Gemma Habitats East Coast Casas? 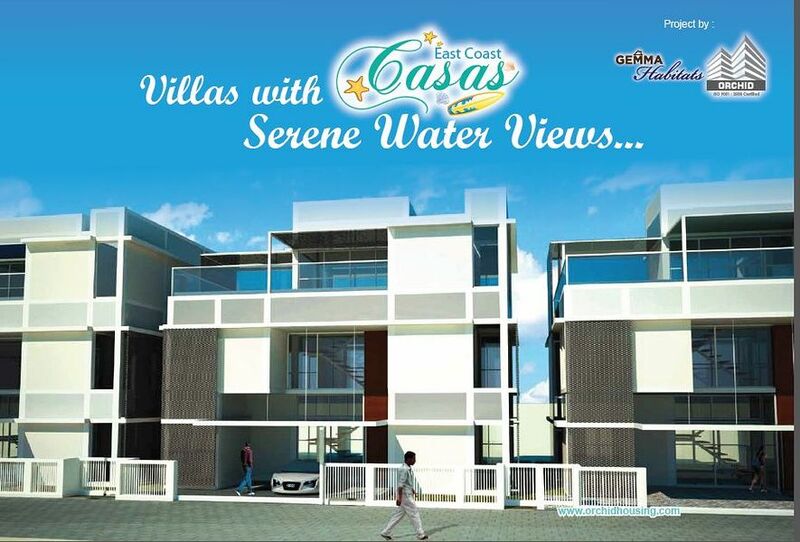 “East Coast Casas” an 4 imperial styled Villas which will augment once ownership pride. Absoluteventilation for a healthy green living conglomerate designed to be excellence of living infrastructure. Key factors are its location, swimming pool, three levels of garden, a home theatre system, gym, private elevatorwhich provide utmost privacy, grandeur of experience the heavenly elegance of a villa. The sun light and the air circulation make living in our homes a natural garden. “The East Coast Casas” is project with modern design features to ensure privacy, tradition of light and air circulation. The sure sort of indulgence at easily accessible location is a fortune in a fine package. Bedrooms with flush doors embedded with teak wood design beadings. Flooring for all Bathrooms - 12" x 12"
Committed to providing luxury homes at affordable prices, Gemma Habitats believes in living a life of purpose.Whispering Villas, Gemma Habitat’s first properties, are a place where one can renew their body and spirit in an affordable, harmonious and beautifully designed space. In Whispering Villas, we have created meticulously planned, independent homes where the overworked and over-stressed can live peacefully only moments from the hustle and bustle of the city. We can make your dreams affordable!